We’ve licensed access to our PRO DJ LINK network information, which helps VFX companies bring DJ performances to life with hypnotic visual effects. 28th March 2019: We’ve licensed access to our PRO DJ LINKTM network information, which helps VFX companies bring DJ performances to life with hypnotic visual effects. PRO DJ LINK enables you to sync lighting, video displays and pyrotechnics with audio played on our professional DJ set-up. Widely used by DJs at major festivals and clubs around the world, this set-up includes the CDJ-2000NXS2 Pro-DJ multi player and the DJM-900NXS2 Pro-DJ mixer. Licensed companies can connect their products1 to our free specialised app, PRO DJ LINK Bridge, to access the PRO DJ LINK network. The app ensures seamless syncing between visual effects and DJ performances, enabling DJs, event producers, lighting designers, LJs2, video creators, and VJs3 to blow away crowds with multi-sensory shows. To use licensed companies’ products with our professional DJ set-up, you need to use the PRO DJ LINK Bridge app4. This app helps the PRO DJ LINK network system to run smoothly. Visual processing technology for software and media servers: ArKaos S.A. Integrated lighting and media control for visual technology: Avolites Ltd.
Hardware and software for real-time video manipulation: Green Hippo Ltd. Visual software and media server: Resolume B.V.
2, 3: LJs (lighting jockeys) are artists who perform with lighting effects. VJs (visual jockeys) are artists who perform with visual effects. At many music festivals and events, DJs, LJs, and VJs collaborate as a team, performing together to enhance the show. 4: When TC Supply’s ShowKontrol is used, PRO DJ LINK Bridge is not required as ShowKontrol includes the equivalent feature within the software. * PRO DJ LINKTM is a trademark of Pioneer DJ Corporation. * ArKaos is a registered trademark of ArKaos S.A.
* Avolites is a registered trademark of Avolites Ltd.
* BLCKBOOK is a trademark of BLCKBOOK B.V.
* Green Hippo is a trademark of Green Hippo Ltd.
* Resolume is a trademark of Resolume B.V.
* ShowKontrol is a trademark of TC Supply. * TC SUPPLY is a trademark of TC Supply. Pioneer DJ Europe Ltd is the subsidiary of Pioneer DJ Corporation responsible for sales and marketing in EMEA. For more than 20 years, Pioneer DJ has been a market leader in the design and production of innovative DJ equipment and software. The company works closely with DJs and clubs to deliver next generation products that inspire and shape the global dance music community and has recently launched a new range of musical instruments for production and live performances. Its portfolio includes brands such as TORAIZ, Pioneer Professional Audio and Pioneer DJ Radio as well as social platforms KUVO and DJsounds. 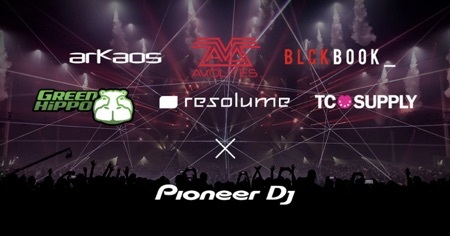 Pioneer DJ Corporation is a privately held company headquartered in Yokohama, Japan and is led by President and CEO Akio Moriwaki and Executive Vice President Yoshinori Kataoka. Download images and marketing assets from https://www.pioneerdjhub.com/. ArKaos is a leading media and real-time visual processing specialist. ArKaos sets the bar high with the development of hardware, real-time video software, and game-changing protocols. The ArKaos Ecosystem allows for the maximum control of light and video, in one easy-to-use comprehensive tool. With world leading VJ software GrandVJ and professional media server MediaMaster PRO, Arkaos delivers a superior level of performance. Since its beginnings, the company has established a culture of excellence, teamwork and ingenuity. A defining feature is the company’s culture of managing complex technology and innovation while making it accessible to the end user. ArKaos always works together with users refining products while maintaining the company's commitment to powerful simplicity. Avolites is a London based innovator of creative visual control equipment, offering both hardware and software solutions in the professional lighting and media industry. Avolites products are renowned for their accessible, intuitive and hands-on familiarity by their users. The company has focused on innovation and end-user feedback which has allowed continual development and evolution of the product range which its global user base has enjoyed since 1976. Avolites’ latest creation, ‘Synergy’, will be released soon. This groundbreaking innovation transforms the entire lighting rig into a canvas for video at the touch of a button, allowing operators to create a completely immersive experience on the fly. Avolites’ Mission is to enable creative ambition to become a visual reality and its products can be found around the world predominantly at festivals, nightclubs, music venues, theatres, live touring and TV & film studios. Since 2012, BLCKBOOK has been one of the market leaders with its timecode software in the top tier of the dance industry. BLCKBOOK works with top artists, crews and leading industry companies to bring the professional software to a broader audience and get everyone in sync with quality. TimeCode is the missing link between the DJ booth and front of house. The software syncs your lights, visuals, SFX and much more, perfectly to your DJ set-up and lets you know exactly what is happening in the DJ booth. The software is easy to use – simply plug it in and the tracks will sync. Green Hippo is specialists in the design and manufacture of hardware and software for real-time manipulation of video in the AV industries. Based in London and Glendale, California, Green Hippo provides innovative solutions and support to users, distributors and installers worldwide. Formed in 2000, Green Hippo has grown from a specialist manufacturer of bespoke solutions to one of the leading players in the ever-growing field of scenic video. The company’s award winning Hippotizer range is now in its fourth generation and can be found providing real-time video playback for television sets. Theatre spectaculars utilise the system due to its flexibility during production periods, and concert tours have proven its reliability out on the road. Resolume makes the industry standard VJ software Avenue and the media server Arena. Awarded for its easy to use yet powerful features, Arena is used by thousands of VJs all over the world to play the visuals for the world’s top DJs at the hottest clubs and festivals. Resolume was founded in 2001 to bring faster improvisation to live visuals. The company aims to make VJing more interactive, more expressive and more fun. Resolume is based in The Hague. The Netherlands is well known for its electronic dance music with its many clubs and many of the world’s best known DJ’s come from the region. Founded in 2004, TC Supply is an entertainment technology company specialised in creating powerful tools and applications for real-time synchronisation of show elements including video, lights, lasers and pyrotechnics. TC Supply has developed features such as automation and extensive networking options, making it possible to directly connect to key equipment like lighting desks and media servers, along with multiple systems for larger setups. In 2017, TC Supply and Pioneer DJ partnered to extend PRO DJ LINK and create the ultimate successor to the first ShowKontrol application. Today, TC Supply’s products can be found worldwide, used by DJs, venues, festivals and theme parks.